Two years later, “The Wolves” became DeLappe’s first produced play. By 2017 it was a Pulitzer Prize finalist in Drama. The play has rocketed into the national theater scene like a penalty kick. Local fans will finally have an opportunity to see it this month at the University of Nebraska Omaha. The “Wolves” are a high school girls’ indoor soccer team. The entire drama takes place on the pitch, generally as the nine teammates warm up and run through drills while discussing everything from the genocide in Cambodia to tampons, often at the same time and over other similarly random conversations. According to the director, Cindy Phaneuf, DeLappe compares the overlapping dialogue to a musical score, with a variety of instruments playing at the same time, but with some more prominent while others are more in the background. The athletes are all different: one is an immigrant, one is gay, one probably has an eating disorder, one is dating a college boy. They are a team, with all the closeness and tension that comes with competitive team sports. The soccer is quite real. Phaneuf cast the show last year to give the actors more time to work on their skills. “At call backs, the actors did soccer drills, just like they were trying out for the team.” After casting each actor was sent home with a soccer ball. Following Christmas break, the actors began soccer practices with their new soccer coach: UNO forward Erinoelle Clifton. Clifton, who played in every match last season, over half as a starter, originally planned to just get the actors up to speed on their skills. But she fell in love with the process and continues to attend all the rehearsals. The soccer is quite good. A long time soccer fan, I attended a rehearsal and watched the actors run through their passing drills. They finished up by blasting shots into the curtain behind the stage. They’re legit. And they have to be. Robbie Jones has designed a set with a circular turf pitch raised thirty inches off the ground. It makes for fantastic sight lines. It also leaves the Wolves with little margin for error. The audience is like a fly on the wall, listening to the athletes socialize and watching them react to injury, tragedy, and all the day to day drama that is the life of a teenage athlete. Phaneuf appreciates how organic the dialogue is. “When the cast warms up, they have some of the same conversations their characters have.” And just like their characters, Phaneuf notes her actors run through their drills each night, putting aside the stress of their day (schoolwork, flooding, even the death of a family member) to do something they love together as a team. I’m looking forward to rooting these Wolves on to victory. 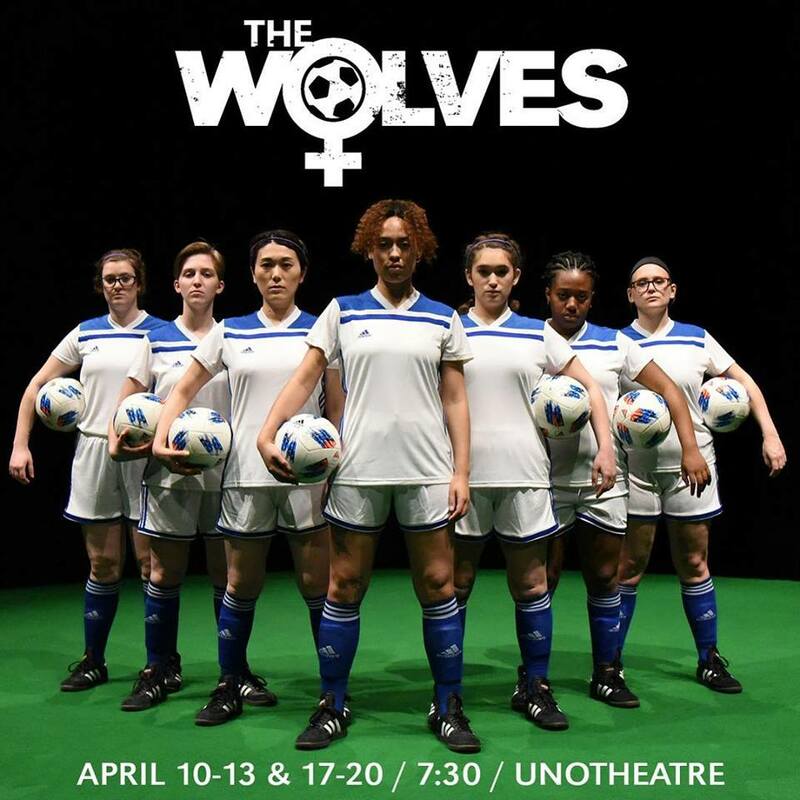 “The Wolves” by Sarah DeLappe will run at the Weber Fine Arts Building on the campus of UNO, 6001 Dodge Street, from April 10-13 and 17-20. Curtain for all shows is at 7:30. There will be a TAG Nite Out on Wednesday, April 10. Previews are April 10 and 11. Opening night is April 12, with a reception following the show. Remember to bring your TAG membership card—you will need it for the TAG Nite Out. Ticket prices are $16, although tickets for the two previews and the Wednesday, April 17 production are only $6. There will be a curtain talk following the Friday, April 19 show. Tickets are available at the UNO Theatre Box office or on line at https://www.unomaha.edu/college-of-communication-fine-arts-and-media/theatre. All major credit cards are accepted. Questions? Call the box office at (402) 554-PLAY (7529).